Finisterre is a surf shop, a surf shop which, for the last four months, has been home to a lovely little espresso bar. Tucked away on Earlham Street, between the busy Seven Dials and the even busier Cambridge Circus at the intersection of Charing Cross Road and Shaftsbury Avenue, it’s a haven of tranquillity and excellent coffee. 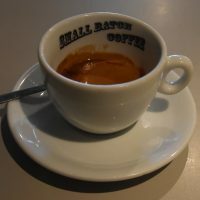 Supplied by Brighton’s Small Batch, Finisterre doesn’t try to do too much, instead concentrating on serving top-notch espresso in a lovely environment, something which it does exceedingly well. The coffee menu is concise and to the point, with Finisterre making good use of Small Batch’s versatile Goldstone Blend. There’s not a lot to Finisterre, although that statement holds true only if you’re looking at it as a coffee shop, which is a little unfair. Finisterre is also the flagship London branch of the Finisterre surf chain and, as a surf shop, there’s quite a lot to it. That said, the coffee shop has definitely got pride of place (and the best spot), sat in the front of the store and occupying the window, with a convenient bench outside on the quiet street. May 2018: I’ve recently learnt that Finisterre is no longer doing coffee, although there are plans to reintroduce filter coffee, so watch this space. Piccadilly Grind is, as far as I know, unique, being the only coffee shop inside a London tube station. There might be others in the outer zones, but this is certainly the only one in a Zone 1 station. It’s an unexpected setting, but certainly a welcome one, meaning you can get great coffee on the go from seven in the morning until ten at night (nine until eight at weekends). Hopefully we will see more of this sort of thing in the future! Tucked into literally a hole in the wall on the main concourse, it blends in well with its surroundings. 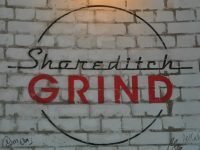 Despite its relatively small size, Piccadilly Grind is anything but a small coffee shop in its outlook. It’s even got seating, power and free (sort of) Wifi. The only thing that it doesn’t do at the moment is pour-over. 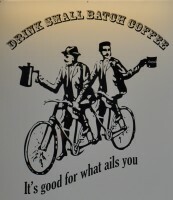 Other than that, there’s a comprehensive espresso menu (house-blend and decaf, both roasted by Brighton’s Small Batch), tea from Tea Pigs and an impressively wide ranges of soft drinks, pastries/cakes and (at lunchtime) sandwiches. You can either order your coffee to go or sit down on the bench and, in the quieter moments, chat with the baristas. November 2014: Sadly Piccadilly Grind is no more. Although I didn’t realise it at the time, it was always intended to be a six month pop-up, and closed at the start of the month.